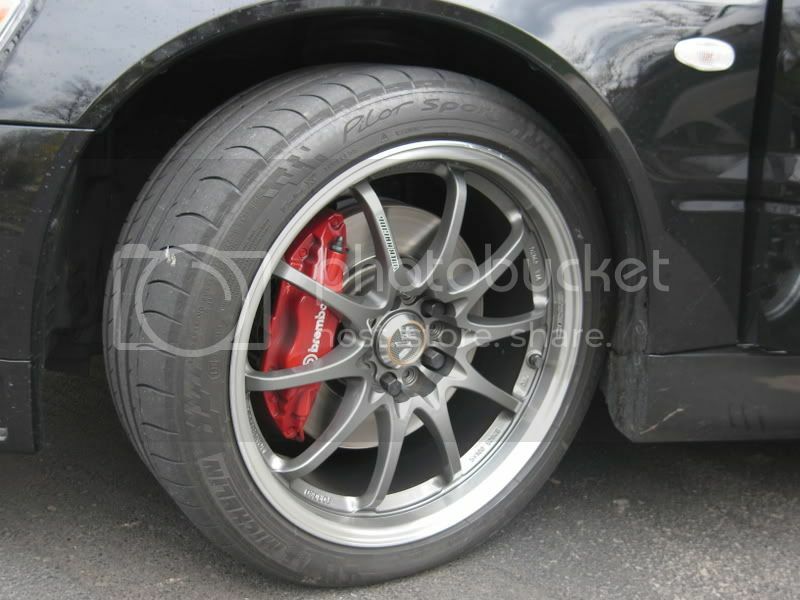 I just installed my Volk LE-28N's with 245/40R18 Michelin Pilot Sport PS2's; when I turn the wheel, I can even hear the tire rub the fender...what's going on? I tought I would be safe with this size tire, especially after reading all the threads with people running them? Input on how to solve the problem would be most appreciated. Last edited by Mitchubishievo; Apr 9, 2007 at 08:22 PM. And I'm well aware of how to mount a tire, especially since after market wheels have no "slack" like stockers; leave your sarcasm at home. Anyone have something constructive to add? I am having same issue also along with rear fender rubbing. I installed 255 40 18's rt615 tires and have stock height. I am looking into rolling my rear fenders and don't know what I am going to do with the front wheel well fenders? What size rim, what offset? What exactly is rubbing? 18X8.5 +30 offset...a safe size. The tire is rubbing the inside of the fender well , close to exactly the middle of it. The outisde of the tire looks like it's making the contact. What are the exact measurements to your wheel/rim? That is a safe size and offset, there should be no problem really. What fender well do you mean exactly? The front or rear? Is it rubbing the cars body in the rear, or some of the plastic liner in the front? Post a pic if you could, im not exactly following you. Front fender well...I'll get some pics tonight or something. Those size tires will rub the inside piece of plastic in the well. I am running the same size and when I make a hard corner or something it will rub for a second. I knew that going in when I made the purchase, though. Last edited by 8thWonder; Apr 9, 2007 at 02:05 PM. EDIT, I see it is a +30. yah they have a tendency to eat the inside plastic ... look at them carefully and you will see its prally gunna be chewed out .. Most ppl just remove them .. Im thinking of fabricating a hard plastic piece like they have in rally cars .. cause i still want that added protection from debri. That shouldn't be rubbing at all 245/40 with an 18X8.5 +30 is as safe as you can go, and your not lowered at all huh, that's weird I had 255/35 with a 18X9.5 +28 on the front of my car, slammed and it didn't rub, get under there again get pic if you can, please. Last edited by Torre from Va.; Apr 9, 2007 at 09:37 AM. Find More Posts by Torre from Va.